I am really inspired to share my experience watching the documentary film "Earth" with my daughter, which was originally released on Earth Day 2009. It harkens to an earlier time in my own childhood. I remember watching "Omaha's Wild Kingdom" on Sunday nights as a young person, usually at my grandparents' house. Instead of the sensationalism typical of today's tv experience, we get to feel like we are one with our planet. We can quietly reflect on the beauty of our world through the insightful lense of filmmakers Alistair Fothergill and Mark Linfield. Experiencing the daily life of polar bears, elephants, humpback whales and many other diverse species are reminders of our connectivity to all living things. I highly recommend sharing this stunning visual and sound experience with your children, the stewards of this earth. "Earth" will be shown at the Princeton Public Library this Saturday January 2nd at 1:00pm. I am really excited about the Princeton Environmental Film Festival. I will be attending one of the first films out on January 4th titled "Fresh." It is exciting to be apart of a movement that is sweeping our culture. As many of us in the Princeton area walk to our local farmers market, we are inspired to keep farmers farming and encouraging the market to become a more local and sustainable model. Whether we eat more simply and more locally or garden our properties with natives that thrive without such an intensity for chemicals, it all leads to a more vibrant system that will succeed. I am proud to have my child attend The Waldorf School of Princeton where gardening is taught as a subject matter once a week. Our young people are taught to tend the garden and to farm produce in season in which they share a weekly meal. It is another day of winter, mild and rather dry. My herbs are waiting for a little bit of plant food to nourish them while they wait to return outside. Some Guy Wolff pots snuggle my herbs and scented pelargoniums. Personally, I would rather have a few hand throw pots than those made by machines. Since most of the plants are dormant they don't look as stunning, but won't it be nice to stay frugal and let them grow and return bigger in the spring to the outside wee patio. It's Winter in Princeton..Yet Bulbs are Here..
As we pass the shortest day of the year one has to wonder why I still have alliums, snowdrops, and anenomes still in the carriage house. I decided to out myself so I might get off my duff to still get these in the ground. Fine, I put about 500 bulbs in already but my work is not done in the garden. I have ordered some lovely amaryllis named 'Emerald' that I wait for to arrive. The container pots of herbs are thriving inside though they long for some copper linings underneath them. The snow has been washed away and I must take my moment tomorrow to put all outside bulbs to bed. My daughter made a lovely wreath at the Waldorf School of Princeton which is adoring one of our bird bottles. As the garden sleeps the birds need to be taken care of in a most special way. We leave black oil seeds and many nuts for the songbirds to enjoy. Now I am wondering how I will get the alliums still left to be put in the garden along with some bare root peonies that did not make it in either. As we turn inward, is it rather delightful to tend to our houseplants. Many of my herbs and scented geraniums have been brought inside to face the winter sun where it is cozy. It is the time of year when I really love to have a beautiful rosemary topiary in the kitchen, ready to be snipped for flavoring. As the shortest day of the year approaches, I wanted the folks in the village to feel light as they might walk in the Hopewell boro preserve. It is a simple gesture like this that gives us that feeling of home shared among many. So this year, I decided that one tree was not enough for the new carriage house. This faces the back of the house and sends light over the fields while the garden beds down. The only shrubs holding fast on their own are my English boxwood. The tree is not decorated. It is to celebrate nature in the raw, if you will, and a gift to be simple. I wanted to show you the copper cap that has been custom fit for the chimney. It is rather lovely and gives the carriage house a nod to earlier times. I had a Princeton artisan come and fit it perfectly. This is the very back of the house which faces the open fields. The home is long and narrow and looks rather like a doll's house. It is a bit bigger than it looks, as this is just the master bedroom. The copper cap is content to rest on this plot of land with a swimming mermaid on top of the garden shed. Small details like these are just the things that can add a bit of value for you to enjoy your home and garden. Much more charming than a cage on top of the chimney to keep out critters. This heuchera which is a lovely ground cover, loses no beauty in the winter. It is almost as though as the temperature drops the purple wine colors mature. I have this in two places in my newly divided perennial garden here at the carriage house in Hopewell. I have planted many pink tulips that will come up around this specimen. Since the house is a deep grey, the pinks and purples really lend to each other. What I love about Heuchera is the lack of disease and pests and they are just a lovely winter interest in the garden when my sun loving perennials die back. This variety is large enough to stand alone yet smaller varieties look nice clumped together. Many of us knows these as coral bell flowers and they can be native from Connecticut to western Canada to Mexico. Soon I will share the tiarella foam flowers that I also have in my garden in the true native section. When looking to spruce up a garden gate, I need look no further than the woods. The ingredients can be as simple as evergreen cuttings, decorative kale, cabbages, and crabapple and pear clippings. I also gave a nod to Hopewell Valley's farmland by adding a corn tassel. And don't forget that pansies are a mountain flower able to withstand a freeze to five degrees. That comes in handy if you want a flower in the mix. My gate is now a welcoming entrance to all visitors- friends and family coming for the holidays and my beloved wintering birds. During this holiday season it is wonderful to think about decorating with local color and foliage that represents an indigenous and seasonal flair. I absolutely love creating container plantings and unique window boxes for myself and my clients. There is much to be said for simply trimming with evergreens of many varieties, adding some american holly and crabapple branches along with decorative pear branches to make stunning eye candy, even for the birds. Don't forget to add some lovely pine cones. Mine came from a friend in North Carolina who collected them in her yard. Now a fun thing that I have done for our first year in this house is grace many of the windows with candles, and I brought home two Christmas trees. One is in the back of the property where I have decorated it for all to enjoy when walking in the nearby fields, and one is the front of the house in the kitchen, which I will call the town tree, right on Broad Street to be enjoyed by all. I have also placed a huge, simple wreath in the front of the house. It's nice to be home for the holidays. I really wish I had taken a picture of the old, crumbling concrete steps before I had the crew I work with in garden design come and build something much more organic. My idea was to use truly local materials (almost everything is from within 2 miles) that both supports local businesses, reduces my carbon footprint by not using petroleum derived products, improves permeability of water to the earth, and creates a lovely natural, green path up to the house. This fall I transplanted some different types of local mosses that are now dormant within the cracks. I have also planted many bulbs in the surrounding flower beds that I look forward to seeing in the spring. The stone steps bring back some charm to this old carriage house and beg for more perennials next year. Sometimes just taking the risk to do something very different upticks your real estate property quite a lot and makes your dwelling that much more memorable to others, especially with its sustainable approach to design. I love that the stone is sourced locally from Hopewell, literally just a stone's throw away! Sometimes the best laid plans need to be pulled up and relaid. This fall, I had my landscape crew regrade the patio and all walkways. I integrated a couple of bits of solid bluestone at each landing. We left all of the beautiful old moss on some of the brick and installed my sundial as a focal point in the garden. True English boxwood stand as lovely anchors in the perennial beds. Everything else had gone to hibernate over the winter, but I will share photos in a future spring post when the plants come back to life. Ivy is spilling over a most unusual wall made out of telephone poles from the fifties. 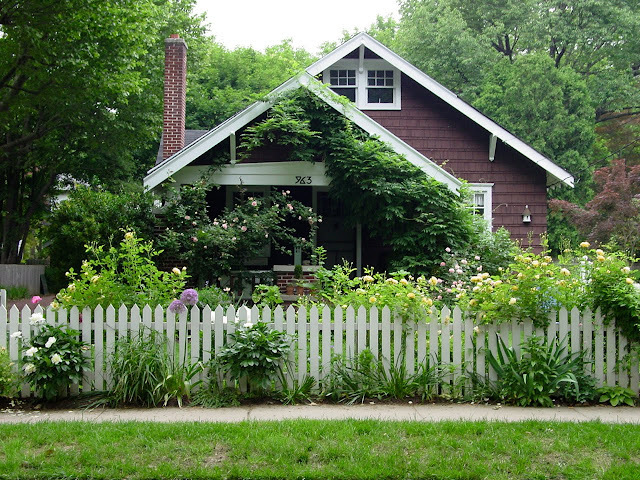 It is a bit quirky, but it works as an original fence between neighbors. What makes an outside patio in a small lot so vital is that it continues a very social element for a small town feel. To live on a Main Street one mingles with the sound of the trucks, a few proud sirens from the fire engines and the romantic whistle of the freight train. I have to say, all of it binds me to this Hopewell village. As I mentioned in At Home in Hopewell, our renovated carriage house does not have a garage. Instead, I purchased a classic cedar shake shed to hold all of my gardening tools, bikes and other outdoor toys. The cupola on top is made complete and distinguished with a swimming copper mermaid. Of course, it has a bit of whimsy because where are mermaids really to be found in Hopewell Valley? I also added a complementary accent on the carriage house itself by gracing the chimney with a custom copper cap found on old homes and farmhouses. It is lovely to collaborate with an artisan who still works with copper. I have found that with a little piece of real estate, it is so important to get the details right. 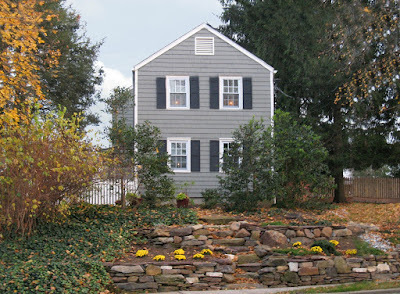 A garden, a bird bottle, a sun dial or a chimney cap all bring eye-catching accents together to make a house a home in our most charming village of Hopewell boro. I recently bought a carriage house built in 1890 in the historic district of the borough of Hopewell that backs up to Hopewell's preserved open space. I learned first hand how knowing one's needs and moving swiftly were the keys to finding home! When I was considering a move in spring of 2009, I concluded that it was definitely the time to buy. Prices are within reach in a way we have not seen in years. I decided to take the plunge myself and move from a more transit centered environment to the walkable village of Hopewell Boro. Some of the considerations that made it an easy transition was knowing that the schools in Hopewell Valley are very solid and that the village is an easy walkable community. Its roots feel bit like Vermont. Many small town community events such as films at the historic train station and farmers market give it a down to earth vibe. Then what to buy? I knew that I wanted something that I could manage on my own and a property that would lend to all of the charm of this sweet little village. Hence, I found something that had been on the market quite a while which had not adjusted in price for the new world order. I went to look at it along with about three other properties in the Boro. What I liked about this property at first glance might have been easy for others to overlook without a clear vision. There is no garage. That is solved with a lovely cedar shake shed charmed with a window box to boot. Many projects were left undone when I found this property. An old fence was in need of repair and a new fence had not yet been painted to match the house. Appliances needed updating and a water softener would need to be added. A beautiful old brick patio needed to be pulled up and pitched properly away from the house and relaid. The yard is extremely small but will be transformed into a perennial garden with many native plants to flourish. While I studied all of this I also looked at the comps and prepared my first offer. I knew what had to be done with this house and I knew where to stop with my final offer. This is where I had to be a professional even to myself. I knew the number that this house should sell for and I had to be prepared to walk if I had an unreasonable seller. I would say one of the most important things to start with in this process is a clear vision of what you need and want. I needed a solid and not overly large house. I needed the backup of great public schools and I needed to be close to the equestrian life that is so important to my daughter and close to her friends. I knew that I could handle some amount of renovations that I would be pleased to make on my own instead of paying for someone else to have made those decisions on my behalf. I knew that I would enjoy the 50 acre parcel of open space behind this house that is easily accessible to anyone living in the Boro. After I was clear about my needs, I made a swift offer with a 30 day closing. We are enjoying the process of making it our own and folding into an old community vibrant with new life and proud to hold to its village character. Come visit sometime! I started the process of designing a garden for this property in Princeton Junction with the desire to honor the bones of the dwelling. This is a classic small, California-style bungalow built in 1928 by a local architect from Trenton, NJ. It was designed at the tail end of the Arts and Crafts movement when the vision was for nature and our inside space to flow seamlessly from one to the other. The garden should invite you in, and the front porch should allow you to drift right out again. It should almost feel as though one does not know where the garden ends and the bungalow begins. Wysteria climbs the roof and provides delicious shade as the summer heats up. Climbing roses balance the other side of the front of this home for a celebration of color and fragrance through the last week in May. Since this house has had no additions to speak of, I really wanted to keep the feel of the garden old fashioned and sensible, just as the architecture is itself. I went to work planting heirloom bulbs, dwarf to large hostas, ferns and native woodland flowers. I especially enjoyed selecting the sun loving perennials. Peonies, hollyhocks, Grahamn Thomas roses, Black Eyed Susans, Coneflowers, Bearded Iris, Japanese Iris, Hydrangeas, Clematis, Monarda and several tree peonies... just to name a few sun lovers. These perennials keep the butterflies happy year after year, and a few goldfinch also.